Speakers are an important part of a gaming experience. 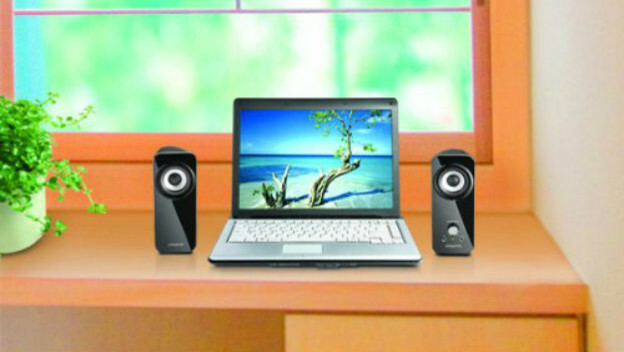 Whether you are supplementing a laptop, MP3 player, or handheld gaming system or picking up ones that will help act as one of your main sound systems, buying the right one can be a big decision. Especially since there are so many options. However, if people want to get creative and go Creative, they'll find both the Inspire T12 wired and Creative T15 both deliver great sound quality and work to facilitate different needs. The Creative Inspire T12 is a pair of speakers that you set up and have keep you company at a desk, on an end table, or in a space where you know you will be spending a lot of your time. Each one of this pair is 180mm tall and 71mm wide, and they have two drivers. Once you find where to put them, you can use a headphone jack to get an MP3 player or handheld gaming system like the Nintendo Switch hooked up. Or, if you prefer, you can use the auxiliary-In connector to get a PC or tablet all set. In either situation, getting set up is simple, you have a wired connection to guarantee fidelity, and there's even BassFlex technology to add more richness for a fuller sound. You plug it in, you start playing, and the speakers do all of the work. There are even on-speaker volume controls, so you can more directly access and alter the sound levels. A bit of form and function is at play too, as they have a slight tilted angle at the front, to offer some audio throw and improve the sound range. It comes in at $79.99, though Creative has them on sale for $59.99. The Creative T15 wireless speakers do have a lot in common with their T12 sibling. The size is similar. They're slightly bigger, at 200mm tall and 90mm wide. They also are only available in black. They have the same two-driver design, to make sure you have clear audio quality. There is also a focus on offering deep bass sound, though these rely on BassXPort technology, with its port tube, to provide rich depths and tones. It even has a 10 degree tilt in the name of audio throw. Really, the major difference on a tech level comes down to the wireless options and some slight range. The Creative T15 works with line-in wired connections or allows you to tap into Bluetooth to increase your range and versatility. Perhaps in a bid to also work with that, since it might be paired with devices where you can't control the treble and bass on them, it has on-speaker controls to adjust the tone and volume. It may strike people as a bit more versatile and easy-going. So, how would this impact a potential user? Well, the T12 speakers would probably be a good fit for someone who would see themselves staying at home and needing better sound quality. You could have them at your desk for your laptop or PC. If you like using your Switch in tabletop mode, you could connect it to provide a better experience when playing a game like 1, 2, Switch or a Jackbox Party Pack. The T15 seem like they would be better for on a whim entertainment. Maybe you have people coming over and want to stream music from your or their phones. Connect to bluetooth and do that. Maybe you play massive games on your tablet, like Transistor, Dandara, or Stardew Valley, and want to better appreciate those soundtracks. Tap into the T15 and let the sound surround you. Both speakers have the Creative tech and quality people come to expect from the company and its hardware. They're versatile items that serve you in multiple ways. It comes down to how you think you might be using them. The T12 wired speakers might be a bit more stationary. The T15 could be a little more impromptu. Neither one is really better than the other, so it comes down to which best considers your needs.